Katie Irani was born in her mother’s family home in Ahmednagar, India, in 1920 and passed away in Meherazad, Ahmednagar, India, on 29 May 2009, at the age of 89. Her sister Dr. Goher Irani was born in Quetta. Meher Baba first contacted Katie and her sister Goher at their family home in Quetta when they were respectively 3 and 7 years old. He would visit their family in Quetta from time to time thereafter. When Baba asked Katie’s mother how many children she had, and she replied, “seven, Baba.” He told her, “No, you have only five – two, Goher and Katie, belong to me.” Katie and Goher were both members of Meher Baba’s Circle (LM 525, 536, 657). Katie was sent from Quetta at an early age to Ahmednagar to live with her mother’s family and cousins in Khushru Quarters (later commonly known as the “Trust compound”). There Katie saw Meher Baba many times. In 1933, after an earthquake leveled Quetta, Katie’s father, Rusi Pop, as he was affectionately called, shifted his family permanently to Ahmednagar. They would frequently visit Baba at Meherabad. At the age of 18, Katie was invited by Meher Baba to travel with His other Women Mandali during the Blue Bus tours. One of the purposes of the Blue Bus Tours was to contact masts and other spiritually advanced souls throughout India from 1938 to 1941. Katie joined Baba at the beginning of the tours in Dec 1938 in Hyderabad, escorted via train (LM 2339). During this period, Meher Baba’s group stayed for some time in Bangalore in a mansion near a golf course called the “Links”. While staying here and elsewhere the women would often stage humorous skits for Baba’s entertainment, written and directed by Mani. Katie often assisted Mani with the scripts and was also expert at acting in these skits (LM 2488). When Meher Baba shifted the Bangalore “Links ashram” back to Meherabad, Katie stayed with His other resident Women Mandali in their secluded compound up the Hill near to Meher Baba’s Samadhi. Katie worked in the kitchen (LM 2699), cooking for the Women Mandali for 11 years. During this period, Kitty Davy taught Mani and Katie typing and shorthand, skills Katie would later use while working under Baba’s direction as the personal secretary for more than a dozen Japanese Consul Generals in Bombay. At one point prior to the partition of India and Pakistan, Baba actually partitioned the Women Mandali at Meherabad into separate groups with separate cooking arrangements (LM 3181). 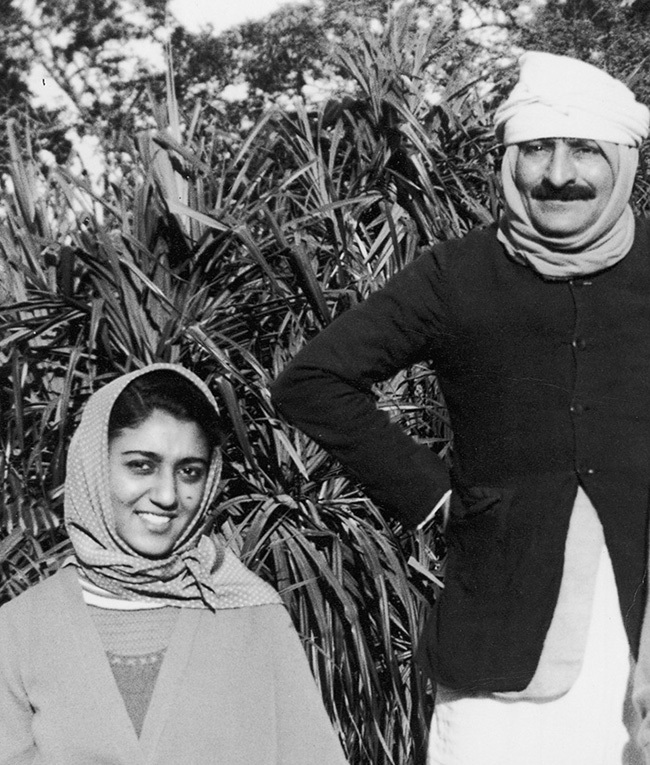 Upon commencing with the New Life, Meher Baba sent away all of the more than 30 women who were living in His ashram at that time, keeping only 4 women to join His New Life: Mehera, Mani, Goher, and Meheru. He sent Katie to live in Bombay at Ashiana with Arnavaz and Nariman. Baba told them that they must accept 100% that they would never see Him again. During this New Life phase, Baba kept Katie and the other Mandali members who chose to remain with Him, whilst away from His physical presence, under very strict orders. Hence even those who were not going with Him had a “deep experience of the effects of the New Life” (LM 3403). Throughout the New Life Katie chose to remain faithfully under Baba’s direct orders (“no cinemas, no parties, no socializing, no outside foods,” etc.). Even before the Diplomatic office was officially established in India, Katie had been directed by Baba to work for the Japanese Consulate in Bombay. Thus she fully participated in the Labor phase of the New Life. Katie had never liked Bombay, yet she stayed there, and her typing skills came in handy as she continued to do this work for Baba under His orders until her retirement in the mid 1970’s. Indeed, this Labor phase of the New Life never ended for her. Upon her retirement from the Japanese Consulate in 1978, by Baba’s order Katie re-joined resident Women Mandali living in Meherazad. Katie helped her sister Dr. Goher with the clinic work giving injections, dressing wounds, etc., alongside Pendu and other mandali members and pilgrim volunteers. Katie was told by Baba to look after His Meherazad kitchen after Naja joined Him, a duty that Katie continued to perform until she passed away in 2009. Katie often recounted, when describing the impact of Baba’s New Life on her own life, that the initial news of it “was like a bombshell.” After more than a decade of living with Him in the Ashram, she had held the belief that the rest of her life would continue in the same way. Katie was a wonderful raconteur and mimic, and would often entertain Baba during her frequent visits to Guruprasad and Meherazad. Baba told her to join Him any time she could get time off, wherever He was staying in India.Katie would visit on weekends from Bombay. Katie would regale Meher Baba and the Women Mandali with many a remarkable tale of her adventures in the mad world outside of the ashram. Many of these stories from Katie Irani have been recorded, during her trips abroad, and on Mehera’s porch whilst visiting with Baba’s pilgrims at Meherazad. During the last few years of her life, Katie Irani set up this video project, recounting tales of her life with Baba, because she felt internally that “He wanted it, for the sole purpose of drawing His Lovers closer to Him.”.